Girard Avenue is covered in snow during a snowstorm in January 2018. 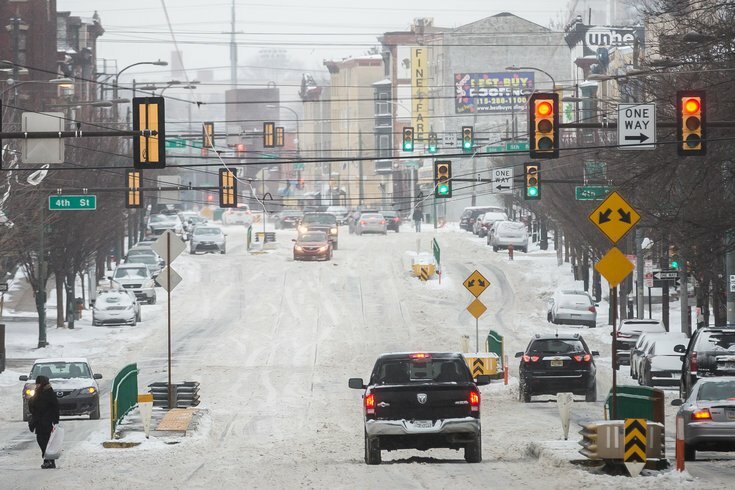 A two-week stretch of brutal cold that blanketed the Philadelphia area finally ended with a brief warmup earlier this week. So did a 15-day-long Code Blue, which city officials said helped hundreds seek shelter and saved lives. Warm and wet Friday, a colder weekend, then accumulating snow? No homeless individual in Philadelphia died of exposure to the cold during the stretch, the Office of Homeless Services said in a press release on Friday. The city "deployed a total of 500 beds and cafe spaces" to people in various shelters overnight, as well as 24-hour outreach and transportation to emergency housing centers that provided shelter during the day, officials said. About 400 people also used the city's volunteer-run warming center at Cione Recreation Center at 2600 Aramingo Ave., which offered hot drinks, blankets, toiletries and mental health and drug and alcohol outreach services. The operation there was tied with the city's efforts to fight the heroin and opioid epidemic in the Kensington and Fairhill neighborhoods. The office also noted that some people refused to take shelter. "As a result, OHS worked with other City officials to ensure that 16 people who refused shelter were kept safe during the Code Blue," officials stated. Thousands of people spread word of the Code Blue on social media.